After 2 1/2 months of my glue gun and me being attached at the hip, my cousin was married to her sweetheart last night. The wedding was one of the most beautiful I have ever attended. My cousin simply glowed. I think I ended up making over 700 flowers by hand out of burlap, paper, cupcake holders, coffee filters, and doilies that my aunt made. My other crafty aunt worked her hands to the bone making pinwheels, doilies and other beautiful hand crafted beauties. We had a craft day where others would help make flowers, cut the burlap for tables and jars and give our glue guns a run for their money. In fact, one couldn't take the constant gluing any longer and croaked. For me, being part of her wedding in the way was an incredible honor, a lot of hard work and in the end, a lot of fun. She mentioned at the reception that due to the help of everyone involved, she was able to have a stress free day. What an honor to be one of many that helped her be able to enjoy her wedding day and not worry about anything. My cousin, one of the most beautiful people, inside and out, that you could ever be blessed to meet, was able to enjoy herself on her wedding day. The reception hall turned out exactly as she had envisioned in her dreams. She said that she had always imagined her wedding this way, just never thought she could have it. I will never forget that I had a part in giving that to her. Now as I give my glue gun a rest, here is what some of what the reception looked like. The glowing P at the head table was a stencil that I made, then cut out of dark paper and back lit with Christmas lights. It looked incredible when the lights were dimmed and is one of the first things the guests saw when the entered the reception all. Pinwheels hung from the stage to match the pinwheel wall. Here is one of the 150 bouquets that I put together. No two were the same which made it easier to put them together. 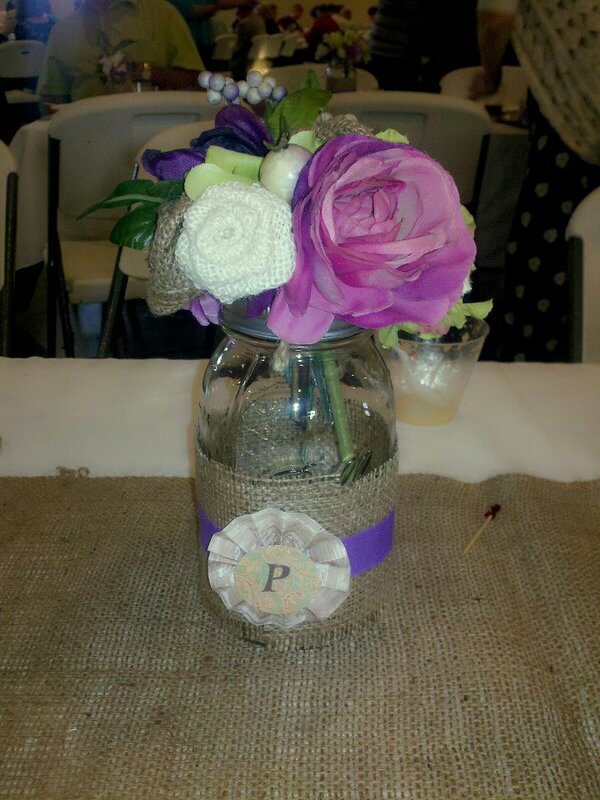 You can see two of the handmade burlap flowers in the arrangement. Burlap for table runners. Twine to tie the napkins, Burlap, ribbon, card stock with a P stamped on them, then cut into circles around the mason jars. Handmade and silk flowers in the jars. Matching flower arrangements placed in an antique tin. This Pinwheel board was approximately 7 feet wide. A close up of the pinwheel board. This was a cupcake stand that my aunt made using this beautiful glass and matching plate. A little gorilla glue and you have a beautiful stand. An old window screen from our house turned into a just married sign for the gift table. The sign was made of burlap garland, card stock and twine. This is part of the entrance. We tried to hide the "Women" bathroom sign by hanging kissing balls, pinwheels, lace from the ceiling. The other side of the entrance. A jar with flowers under the guest book table. This is the arrangement next to the card box. The card box made out of an antique suitcase. 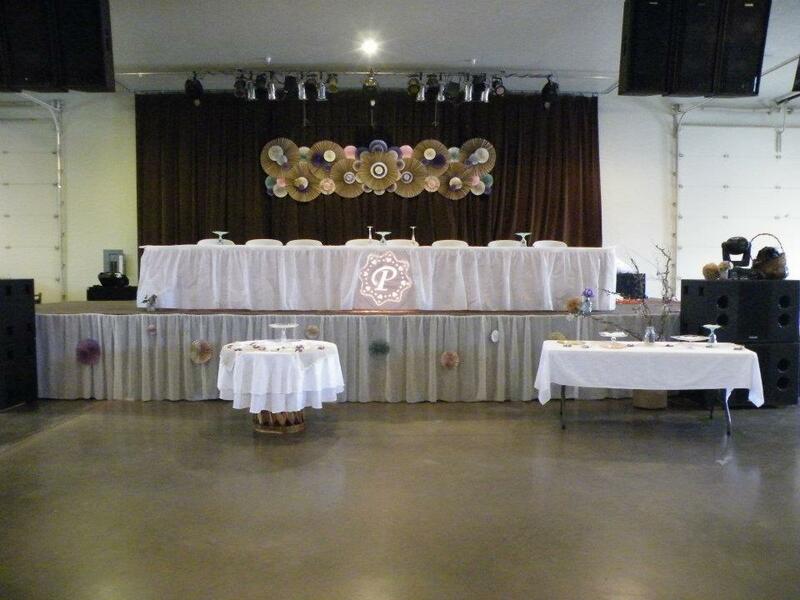 This is the view from the head table. What the photo wall looked like from the head table. The guest book table and gift table. This is a salvaged shelf that I used next to the photo booth. The photo booth. My cousin lined up a photographer and an entire table full of props for those who wanted to take pictures. Many complements were made in regards to the decorations and those who spent countless hours putting it together were able to sit down and relax and watch a fantastic couple celebrate their big day. Wow! So many cool ideas, we love the pin wheel board, what was it made with? They kinda look like oriental parasols? Hello other Frugal Gardener! The pinwheels were made of cardstock. We managed to find a great sale at Michaels where the cardstock was between .10-$25 a sheet. The larger brown pinwheels were made of large brown pieces of paper. I wish the pictures turned out better as it was much prettier than what the images show. To join all of the pinwheels they were hot glued and stapled to thick poster board/cardboard. It took 5 combined pieces to make this entire thing.